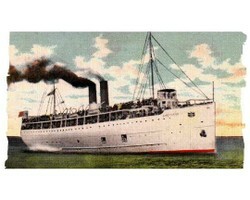 The SS Eastland carried passengers for 12 years, in spite of incidents that proved it to be unstable. When it finally capsized on July 24th, 1915. 844 people were killed. The Titanic and Eastland disasters had much in common. There was a great and tragic loss of life in both. Many women and children were lost in both. And the tragedies happened within 3 years of each other. However, unlike the sinking of the RMS Titanic, the SS Eastland disaster was completely predictable. And the loss of life on the Titanic may well have made the Eastland tragedy more likely to happen. The SS Eastland was called "the Queen of the Great Lakes"
The Eastland was not designed to carry so many passengers. It was a tragedy waiting to happen. The SS Eastland had been designed to carry a heavy load of fruit, with a limit of 500 passengers. She was also meant to move quickly, to transport the fruit. This meant that she would sit high in the water without cargo, and would sit a little higher in the water than other cargo ships when she did have cargo. However, as she was never used for fruit or any other cargo, the design became a flaw - the ship, when used for passengers only, was top-heavy. She was built in 1903, and her design flaws were obvious from the day she was launched. Her center of gravity was high, and that made her liable to listing. This was obvious without one passenger on her decks. However, that didn't stop the Michigan Steamship Company from pressing her into service to carry passengers only. If any proof was needed that she was too top-heavy, the Eastland exhibited that proof almost immediately. Shortly after her maiden voyage, the weight of passengers on the top decks made the problem even worse. The ship listed so badly that water came up one of her gangways. The crew righted the ship by filling the ballast tanks with water on the high side. In 1904, the Eastland was carrying a load of over 3,000 passengers back to Chicago from South Haven, Michigan. The ship again listed, and the problem was again corrected with ballast. The license of the Eastland at that time allowed her to carry 3,300 passengers, even though she had not been designed to carry more than 500 passengers. After that incident, the license to carry was reduced to 2,800 passengers. In 1906, the ship was sold to the Chicago-South Haven Line. No adjustments were made to correct the design to make the ship safer for carrying passengers only. In August of that same year, the Eastland listed badly while carrying 2,530 passengers. After a formal complaint was filed, the carrying license was reduce to 2,400 passengers. The Eastland changed ownership a couple of more times, and underwent a few modifications over the years. The passenger cabins were removed from the space between decks. The smokestacks were made shorter by one third. Somebody was aware of the top-heavy problem, and was concerned about it; two advertisements were placed in local Chicago newspapers offering a reward for anyone who could provide evidence or testimony that the Eastland is not sea worthy. However, nobody came forward and the ship continued carrying passengers as she had from her maiden voyage. Then in 1912 after the sinking of the Titanic, the criteria for lifeboats was changed. Before the sinking, the number of lifeboats was based on the ship's tonnage. After so many died on the Titanic due to lack of lifeboats, the requirement was changed to number of passengers. This meant that the Great Lakes steamers, which were built for speed and all sat a little high in the water, were required to add the weight of lifeboats to their upper decks. For the Eastland, which was already allowed to carry 1,900 more passengers than she was designed to carry, the extra tons of lifeboats was possibly a disastrous change. However, they were added in April, 1912. In July, while leaving Cleveland with a full load of passengers, the Eastland listed first to port, then more severely to starboard. However, she was again righted and continued in service. Then she was sold again, this time to the St. Joseph-Chicago Steamship Company. The Senate Commerce Committee had been advised that approval of the act which required extra lifeboats and rafts on the upper deck of ships, The LaFolette Seamans Act, would be unsafe for many ships, and would be even more unsafe for Great Lakes ships, which would likely capsize. However, the Senate passed the Act and Woodrow Wilson signed it into law in the spring of 1915. The Eastland was considered cautious and attentive to have already added the lifeboats. Then the Indiana Transportation Company was contracted to carry employees and their families to a park in Indiana for the fifth annual picnic of the Western Electric Company's Hawthorne Works. The company's telephone equipment manufacturing plant was located in Cicero, which was bordered on the east and north by Chicago. Many of the employees were from the large Czechoslovakian immigrant community there. This annual picnic was the only vacation day that many of the employees were able to take. It was the main event for the year, with a three-hour trip to Michigan City, Indiana, a day of feasting and playing in the Indian dunes at a park there, and a return trip by night. The St. Joseph-Chicago Steamship Company was enlisted to provide the Eastland to join the three (some say four) other ships that were hired for the occasion. However, as the Eastland had been also been hired for the previous year's trip and had caused a delay in boarding, it was to be boarded first. Though the Eastland was only licensed to carry 2,400 passengers, she would carry 2,500 passengers and 70 crew on that day. A temporary license is created to allow the exception. Altogether, the four ships were to carry over 7,000 people to the park for their holiday picnic. At 6:30 on the morning of July 24th, 1915, passengers began to board the Eastland on the south bank of the Chicago River between LaSalle street and Clark street. The ship was 269 feet long and more than four stories high. The early morning was cool and a light rain was falling, so several hundred passengers, mainly women and children, went below decks for warmth. However, too many were still on the upper decks. Because the extra weight of the passengers was supposed to make the Eastland sit lower in the water, the ballast tanks had been emptied. (If the calculations for weight were not accurate, emptying the ballast tanks of water may well have caused the Eastland to sit even a little higher in the water than she usually did - again raising the already high center of gravity.) Whether or not the ship sat higher than usual in the water, the weight of the extra passengers, the weight of the lifeboats and life rafts and the weight of the newly laid concrete on the between deck were all well above the center of gravity. The Eastland began to list to port, slightly away from the dock, at about 7:25 a.m. The ballast tanks were filled enough to equalize the weight on the starboard side, and the ship was righted. When the captain felt that the Eastland was stabilized again, he gave the order to cast off. This was being done, but the ship was still partially moored when excited passengers moved to port to get a better view of their coming voyage. The Eastland listed sharply to port. The captain shouted, "All passengers to starboard!" That order was impossible for the passengers to follow, as the deck chairs started sliding down toward them on the listing ship, knocking some of them into the water. The Eastland hung at about 30 degrees for a moment. Then, at 7:28 a.m. she rolled completely onto her side. Water flowed into the open hatchways, and the Eastland sank on her side in 23 feet of water. Many passengers were thrown into the water and onto the dock. Some jumped. Others were able to hang onto something and go with the ship at she rolled over, then pull themselves over the side and move with the ship, so they were able to move out onto her side as she found the bottom of the river. The passengers below deck were not so lucky. They panicked and rushed the main staircase. It collapsed under the weight of the panicking crowd. Many were crushed, both on the stairs and below deck, where heavy furniture and a grand piano were thrown into mid-air as the ship rolled onto her side. Most who weren't crushed were drowned as the ship filled with water and they were trapped below. Those killed below decks were mainly women and children. Tugs had also been hired to get the four ships out of the river, and they quickly began to rescue people from the water. The tug, Kenosha, was maneuvered into place between the Eastland and the dock so it acted as a gangplank for people to walk from the ship's side to the dock. The fire department and Coast Guard cutters were also on the scene quickly, and some of those below decks were able to hold on in air pockets until holes were cut with acetylene torches in the side of the ship to rescue them. Altogether, 844 people died. Of the dead, 841 were passengers, 2 were crew members of the Eastland, and one was a crew member from another ship, who had jumped into the water to save passengers and had drowned. Of the passengers, 472 were women and 290 were children. Entire families were wiped out; some sources say 22 families were lost, and some say 24. The Czech community in Cicero lost 220 people that day. There would have been more children dead rather than orphaned if the cost of paying the children's fare hadn't been out of the reach of most employees, whose wages were from $15 to $17 a week. The cost of a ticket, which was $1 for an adult and 75 cents for a child, meant that many children stayed home with friends and relatives. The Red Cross established a huge temporary morgue slightly away from the disaster, as some victims' bodies were being robbed of valuables as they lay on the dock. Also the morning was warming up, and the morgue would allow large amounts of ice to be brought in. The morgue was in the 2nd Regiment Armory on Washington Street. (The old armory is now Oprah Winfrey's Harpo Studios.) Before the large morgue was set up, one of the closer sites was the building across the river, the Reid Murdock Center, which has a photo essay of the tragedy in its lobby. The Eastland Had Made History - Why Is It Almost Forgotten? Was there any justice for the victims? People were outraged and demanded justice for the deaths of so many innocent workers and their families. Charges of manslaughter were filed against the top company officers, and of criminal carelessness against the ship's captain and engineer. However, they had to be extradited from Michigan to Illinois. During the extradition hearings, the builder testified that the ship hadn't been designed for so many passengers, and testimony indicated that thousands of passengers had been carried by the Eastland for years. The Federal court refused extradition, concluding that there was no real proof that anyone had acted in any way in a negligent manner and that the captain and engineer had carried out their duties in a normal manner. So nobody was ever punished for the disaster. The Eastland victims' families were given a total of $563,000. None of this money came from the company that owned the ship or its insurance company. An appeal was made by the Chicago Mayor's Committee for $200,000 to the citizens of Chicago, and donations poured in. The balance came from the Western Electric Company and the Red Cross. There was no further compensation of any kind, including no annual compensation for orphaned children. Three months after the tragedy, the ship was refloated and sold at auction. She was purchased by the Illinois Naval Reserve. The SS Eastland became the USS Wilmette, and was refitted as a war ship. She patrolled the Great Lakes from 1916 until the end of World War II, when she was decommissioned. She was offered for sale as a ship. When there were no buyers, she was sold for scrap. Today, an historical marker occupies the corner at LaSalle street and Wacker Drive across from the site of the old dock on the Chicago River at the Clark Street Bridge. Artifacts and small exhibits are found in several locations around Chicago. Most people in the United States and even many people in Chicago don't know that the Eastland tragedy ever occurred. Even though the Titanic was lost only 3 years before, her loss is still fresh with us today. Yet even the information about the loss of the Eastland is almost lost itself. Why? Several theories have been proposed. Foremost is that World War I was raging, and it took much of the attention away from the capsizing. Another was that there were no rich or famous people on the Eastland. The victims were only normal working people. Yet another is that nothing romantic, such as the band playing, the men sacrificing themselves by sinking with the ship, or everyone in first class being dressed in their evening clothes occurred. Another is that it was a sudden thing, not the hours-long, drawn out affair that was watched by the people in the lifeboats. Some declare that the people of Chicago were traumatized by this great loss, probably both by the shocking loss of life after such a bright beginning to that morning, and by the lack of punishment for any of those responsible. Drowning at the dock may also have seemed like an ignominious end after the glorious loss of the Titanic way out in the ocean, slashed open by an iceberg. At any rate, there are many thousands of descendents who don't know that their grandparents or great grandparents were involved in this tragedy, or possibly even died on the Eastland. Maybe some will want to look deeper if they do their genealogies and see that an ancestor died by drowning in the Chicago River in 1915. That's what I thought when I was writing it, cmoneyspinner. Thanks for stopping by and reading. Story sounds similar to the plane crash that took the life of the young singer Aaliyah. In other words, it could have been avoided, if safety for people's lives was really the Number One concern. If you read "Grapes of Wrath" by John Steinbeck or watched the movie, you know the answer to that question. When we imagine the heat and blood of Gettysburg, it's the men that we see standing or falling in the blasts. But there were women there too, in the ranks, with their muskets.